1Section of Trauma Surgery, Hamad General Hospital, Doha, Qatar. 2Clinical Medicine, Weill Cornell medical school & Clinical research, Section of Trauma Surgery,Hamad General Hospital, Doha, Qatar. 3Department of Surgery, University of Arizona, Tucson, AZ, USA. Clinical Medicine, Weill Cornell medical school & Clinical research, Section of Trauma Surgery,Hamad General Hospital, Doha, Qatar..
Mahmood S, Alani M, Al-Thani H, Mahmood I, El-Menyar A, Latifi R. Predictors of Re-intubation in Trauma Intensive Care Unit: Qatar Experience. Oman Med J 2014 May; 29(4):289-293. Objectives: To determine the causes, predictors and outcomes of re-intubation. Methods: Retrospective analysis of data collected from the trauma data base registry was conducted to identify the extubation failure cases in Trauma ICU at Hamad General Hospital, the only Level I trauma center in Qatar between January 2009 and December 2010. Demographics, mechanism of Injury, complications, injury severity score (ISS), Glasgow Coma Scale (GCS), ICU-length of stay (LOS), and mortality were analyzed among trauma patients who need reintubation within 48 hrs after extubation (group 1) compared to successfully extubated patients (group 2). Result: A total of 954 patients were admitted to the trauma ICU, of which 343 were intubated orotracheally. The mean age of patients was 32±12 years with male predominance (95%). Motor vehicle crash (41%), pedestrian injury (20%) and falls (18%) were the most common mechanisms of injury. Reintubation (group 1) was required in 24 patients (7%). 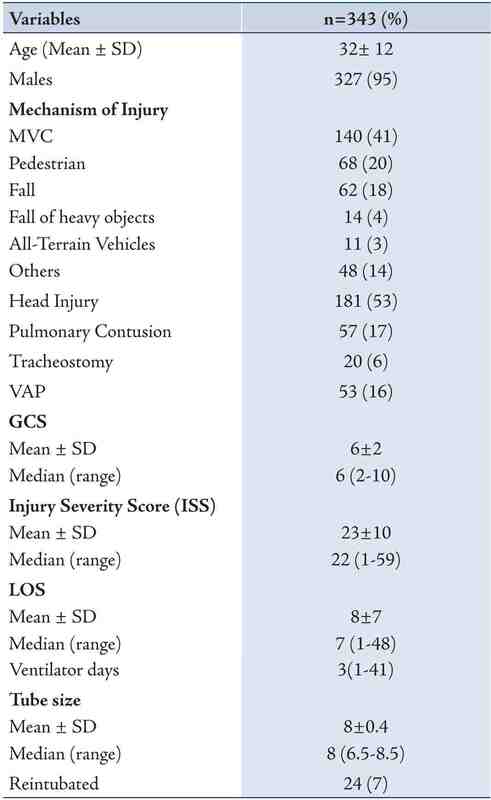 Patients in group 1 had higher rate of head injury mainly SAH (88%), pneumonia (79%) and pulmonary contusion (58%). The mean ICU-LOS was higher in the reintubated patients (p=0.010) in comparison to group 2. Forty-six percent of reintubated patients required tracheostomy. The mean age, ISS, GCS and tube size was comparable among the two groups. Furthermore, reintubation was not associated with higher mortality rate (p=0.910). However, Ventilator-associated pneumonia (VAP) (odd ratio=3.61 [95% CI 1.25-10.44]; p=0.020) and ventilator days (odd ratio=1.09 [95% CI 1.024-1.153]; p=0.006) were independent predictors of reintubation by multivariate analysis. Conclusion: Re-intubation is associated with increased ICU-LOS and need for tracheostomy. VAP and prolonged intubation are independent predictors of re-intubation. Our finding addresses the value of prevention and early treatment of infection in intubated patients. This study may represent an audit of local practice as well. Keywords: trauma, re-intubation, failed extubation, tracheostomy, intensive care unit. Earlier studies reported neurologic deterioration to be independently associated with the risk of reintubation.8-10 Parameter such as pre-extubation imbalance of pulmonary output10 and positive fluid balance (<24 hrs)11 are also involved in the extubation failure. On the other hand, few reports found no association between the injury severity and extubation failure among head injury patients.12 Predictor factors for the need of re-intubation are not well studied in our region. Therefore, the present study was designed to analyze the causes, outcomes, and risk. If tolerated SBT with RR <14, no tachycardia (HR<90) and no desaturation then extubation can be proceeded. Post extubation care includes face tent with FIO2 10L/min, frequent secretion suctioning, proper positioning with chest physiotherapy, nebulizer with bronchodilators, (if needed), continuous GCS assessment, O2 saturation and ABG monitoring. Noninvasive ventilation as BiPAP with PS 10 and PEEP 5 and FIO2 40% can be used if needed. Post-extubation chest x-ray is required for all cases. Re-intubation was performed when patient had one or more of the following criteria during 48 hours after extubation: clinical signs of increased respiratory work, upper airway obstruction, respiratory acidosis, hypoxemia (SaO2 <90%), PaO2 <60mmHg, decreased consciousness (GCS) with inability to protect upper airway, tachycardia, desaturation or tachypnea. All cases of unplanned accidental extubation were excluded from the study. This study was approved by the Medical Research Center (IRB# 11103/11) at Hamad Medical Corporation, Qatar. Data were presented as proportions or mean ± standard deviation (SD) as appropriate. Baseline demographic characteristics, presentation, management and outcomes were compared between the reintubation and successfully extubated groups using the student-t test for continuous variables and Pearson chi-square (χ2) test for categorical variables. Multivariate logistic regression was used to calculate the odds ratio for prediction of independent risk factors associated with reintubation. A significant difference was considered when the P value was less than 0.05. Data analysis was carried out using the Statistical Package for Social Sciences version 18 (SPSS Inc. USA). A total of 954 patients were admitted to the trauma ICU during the study period, of which 343 were intubated orotracheally. The mean age of the patients was 32 ± 12 with male predominance (95%). Motor vehicle crash (41%), pedestrian injury (20%) and fall from height (18%) were the most common mechanisms of injury (Table 1). 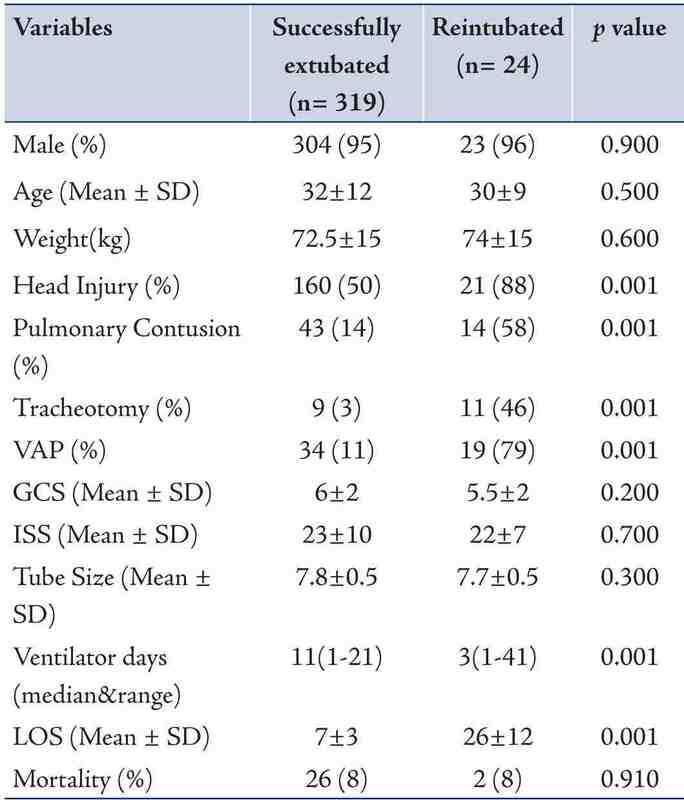 Re-intubation was required in 24 patients with a failure rate of 7% for planned extubation in the trauma ICU (Table 1). The ventilator days were prolonged in those who required re-intubation in comparison to group 2 (p=0.001). The median time for re-intubation (time from extubation to the time of re-intubation) was 18.5 (range 2-23) hrs. The incidence of head injury, mainly SAH (88%), pulmonary contusion (58%), and VAP (79%) were significantly higher in re-intubated patients (Table 2). Of the reintubated patients, 46% of them required tracheostomy. The mean age, ISS, GCS and tube size was comparable among the two groups (Table 2). The mean ICU LOS was significantly higher in re-intubated patients (group 1) compared to extubated patients (26 ± 12 vs. 7 ± 3; p<0.001) (Table 2). MVC: Motor Vehicle Collision; GCS: Glasgow Coma Scale; LOS: Length of stay; SD: Standard deviation; VAP: Ventilator-associated pneumonia. Table 2: Comparison of clinical profile between the successfully extubated and re-intubated patients. In the reintubation group, two patients died due to complications. One died 10 days after reintubation with ARDS and multiorgan failure and the other died 15 days post reintubation with severe sepsis and renal failure. 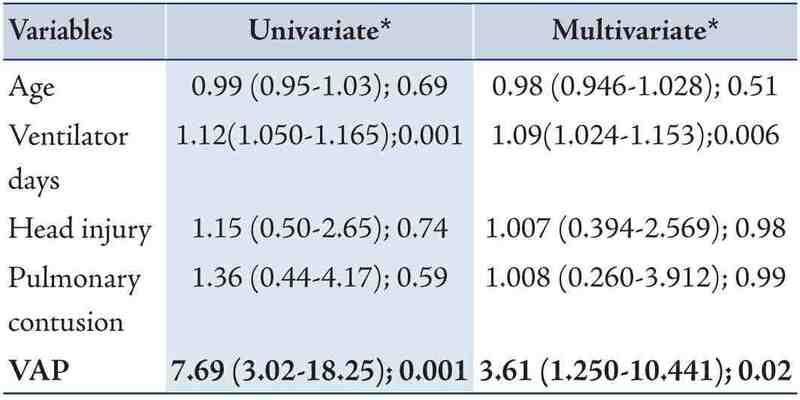 However, re-intubation was not associated with mortality in comparison to successfully extubated patients (group 2) (p=0.910) (Table 2). On multivariate logistic regression analysis, VAP (odd ratio=3.61 [95% CI 1.25-10.44]; p=0.020) and ventilator days (odd ratio=1.09 [95% CI 1.024-1.153]; p=0.006) were independent predictors of reintubation (Table 3). Reintubation is not associated with higher mortality as in many previous studies, but it requires longer ventilatory support, airway protection and prolonged hospital stay in trauma patient.4 In the present study, the length of ICU stay (26 ± 11days) is significantly longer in the reintubated group. Although tracheotomy was needed in around half of the re-intubation group in our study, tracheostomy was not a failure of treatment, but rather an effective respiratory therapeutic maneuver, which could be strategically adopted at the earliest convenience. Tracheostomy facilitates pulmonary toilet, improves patient comfort, and reduces dead space ventilation and airway resistance to allow weaning from mechanical ventilation.1 Arabi et al18 also adopted the use early tracheostomy in trauma ICU patients that eventually helps to minimize the duration of mechanical ventilation, and ICU LOS without increasing the overall mortality. In trauma patients with extubation failure, the majority were reintubated because of stridor, inability to clear secretions, or declining sensorium.5 Daley et al,4 reported increased rate of stridor and tracheostomy in the reintubated patients. The development of pneumonia leads to increased hospital costs and is probably the most frequent cause of death in reintubated patient.4 Torres et al., reported re-intubation as a risk of ventilator-associated pneumonia which could be prevented through proper evaluation and management.19 The incidence of VAP was significantly higher in our patients requiring reintubation and was found to be an independent predictor of reintubation. An earlier study by Kollef et al20 also observed an independent association of reintubation and development of VAP in the intensive care unit. On multivariate analysis, prolonged intubation and VAP are the independent predictors of reintubation in the present study. Also, de Lassence et al.21 reported increased duration of mechanical ventilation, hospital and ICU LOS resulted in a significant increase in the incidence of pneumonia. The major causes of reintubation were respiratory failure, airway safety after pain control with analgesics and opioids, inability to cough, excessive secretion with inadequate muscle strength, laryngeal edema, and severe alteration of consciousness.1,12 Upper airway edema resulted in failure to sustain airway patency also leads to risk of reintubation.1,20 In contrast, Karanjia et al,22 reported that the difficulty in breathing, due to pulmonary injury secondary to pneumonia or aspiration, was not frequently associated with reintubation in primary brain injury patients. Our study did not find significant association between re-intubation and head injury. The association between time for reintubation and eventual outcome suggested that the clinical deterioration might be reduced by early reinstitution of mechanical ventilatory support, especially for patients with respiratory failure.2 Boles et al summarized the key recommendations before extubation as follow: (1) Patients should be dealt with based on the difficulty and duration of the weaning process, (2) Weaning should be performed as early as possible, (3) A spontaneous breathing trial is the major diagnostic test to determine whether patients can be successfully extubated, (4) The initial trial should last 30 min and consists of either T-tube breathing or low levels of pressure support, (5) Pressure support or assist-control ventilation modes should be favored in patients failing initial trial, (6) Noninvasive ventilation techniques should be considered in selected patients to shorten the duration of intubation but should not be routinely used as a tool for extubation failure.23 In a systematic review, Epestien24 summarized the predictors for extubated patients who are at highest risk for reintubation in terms of upper airway obstruction, inadequate cough, excess respiratory secretions, and abnormal mental status. Retrospective nature of the study is one of the limitations. The small sample size of the reintubated group is another limitation for better comparing and conclusion. The current report did not measure other variables such as hypercapnia, pre-extubation serum anion gap levels and pre-extubation Pao2/Fio2 ratio that could predict extubation failure.25,26 Moreover other factors that may affect outcome after extubation such as duration of mechanical ventilation, pharmacological sedation and anemia are not given in the data. Re-intubation is associated with increased ICU-LOS and the need for tracheostomy. Prolonged intubation and development of VAP are independent predictors of re-intubation; a finding that addresses the value of prevention and early treatment of infection in intubated patients. Although, re-intubation does not affect the overall rate of mortality, our analysis may address the need for further assessment of the economic burden of re-intubation and could be a mandated audit in ICU. In addition, we recommend assessment of current therapies to improve respiratory muscle strength, laryngeal competence, neurological status and secretion load for improving successful extubation rates. We thank all the Trauma surgery staff and database registry for their cooperation. This study has been approved by Medical Research Center, Hamad General Hospital (IRB# 11103/11). Authors have no financial issue to disclose, no conflict of interest. All authors read and approved the manuscript. 2. Epstein SK, Ciubotaru RL. Independent effects of etiology of failure and time to reintubation on outcome for patients failing extubation. Am J Respir Crit Care Med 1998 Aug;158(2):489-493 . 3. Seymour CW, Martinez A, Christie JD, Fuchs BD. The outcome of extubation failure in a community hospital intensive care unit: a cohort study. Crit Care 2004 Oct;8(5):R322-R327 . 4. Daley BJ, Garcia-Perez F, Ross SE. Reintubation as an outcome predictor in trauma patients. Chest 1996 Dec;110(6):1577-1580 . 5. Capdevila XJ, Perrigault PF, Perey PJ, Roustan JP, d’Athis F. Occlusion pressure and its ratio to maximum inspiratory pressure are useful predictors for successful extubation following T-piece weaning trial. Chest 1995;108:482-489 . 6. Lee KH, Hui KP, Chan TB, Tan WC, Lim TK. Rapid shallow breathing (frequency-tidal volume ratio) did not predict extubation outcome. Chest 1994;105:540-543 . 7. Ferrer M, Valencia M, Nicolas JM, Bernadich O, Badia JR, Torres A. Early noninvasive ventilation averts extubation failure in patients at risk: A randomized trial. Am J Respir Crit Care Med 2006;173:164-170 . 8. Namen AM, Ely EW, Tatter SB, Case LD, Lucia MA, Smith A, et al. Predictors of successful extubation in neurosurgical patients. Am J Respir Crit Care Med 2001;163:658-664 . 9. Salam A, Tilluckdharry L, Amoateng-Adjepong Y, Manthous CA. Neurologic status, cough, secretions and extubation outcomes. Intensive Care Med 2004;30:1334-1339 . 10. Mokhlesi B, Tulaimat A, Gluckman TJ, Wang Y, Evans AT, Corbridge TC. Predicting extubation failure after successful completion of a spontaneous breathing trial. Respir Care 2007;52:1710-1717. 11. Frutos-Vivar F, Ferguson ND, Esteban A, Epstein SK, Arabi Y, Apezteguνa C, et al. Risk factors for extubation failure in patients following a successful spontaneous breathing trial. Chest 2006;130:1664-1671 . 12. Coplin WM, Pierson DJ, Cooley KD, Newell DW, Rubenfeld GD. Implications of extubation delay in brain-injured patients meeting standard weaning criteria. Am J Respir Crit Care Med 2000;161:1530-1536 . 14. Epstein SK, Ciubotaru RL, Wong JB. Effect of failed extubation on the outcome of mechanical ventilation. Chest 1997;112:186-192 . 15. Miller RL, Cole RP. Association between reduced cuff leak volume and postextubation stridor. Chest 1996;110:1035-1040 . 16. Esteban A, Frutos F, Tobin MJ, Alia I, Solsona JF, Valverdu I, et al. Comparison of four methods of weaning patients from mechanical ventilation. N Engl J Med 1995;332:345-350 . 17. Brown CV, Daigle JB, Foulkrod KH, Brouillette B, Clark A, Czysz C, et al. Risk factors associated with early reintubation in trauma patients: a prospective observational study. J Trauma 2011 Jul;71(1):37-41, discussion 41-42 . 18. Arabi Y, Haddad S, Shirawi N, Al Shimemeri A. Early tracheostomy in intensive care trauma patients improves resource utilization: a cohort study and literature review. Crit Care 2004 Oct;8(5):R347-R352. Published online 23 Aug 2004 . 19. Torres A, Gatell JM, Aznar E, el-Ebiary M, Puig de la Bellacasa J, González J, et al. Re-intubation increases the risk of nosocomial pneumonia in patients needing mechanical ventilation. Am J Respir Crit Care Med 1995 Jul;152(1):137-141 . 20. Kollef MH, Von Harz B, Prentice D, Shapiro SD, Silver P, St John R, et al. Patient transport from intensive care increases the risk of developing ventilator-associated pneumonia. Chest 1997 Sep;112(3):765-773 . 21. de Lassence A, Alberti C, Azoulay E, Le Miere E, Cheval C, Vincent F, et al; OUTCOMEREA Study Group. Impact of unplanned extubation and reintubation after weaning on nosocomial pneumonia risk in the intensive care unit: a prospective multicenter study. Anesthesiology 2002 Jul;97(1):148-156 . 22. Karanjia N, Nordquist D, Stevens R, Nyquist P. A clinical description of extubation failure in patients with primary brain injury. Neurocrit Care 2011 Aug;15(1):4-12 . 23. Boles JM, Bion J, Connors A, Herridge M, Marsh B, Melot C, et al. Weaning from mechanical ventilation. Eur Respir J 2007 May;29(5):1033-1056 . 24. Epstein SK. Extubation failure: an outcome to be avoided. Crit Care 2004;8(5):310-312 . 25. Saugel B, Rakette P, Hapfelmeier A, Schultheiss C, Phillip V, Thies P, et al. Prediction of extubation failure in medical intensive care unit patients. J Crit Care 2012 Dec;27(6):571-577 . 26. Bilan N, Ghaffari SH. Survey of factors effective on re-intubation among children admitted to pediatric intensive care unit. Pak J Biol Sci 2009 Mar;12(5):470-472.